As soon as the spring weather is bearable (read: you don’t need a hat, gloves, scarf, and 10 layers to walk outside), I love to head down to the water's edge of our neighborhood. With a stretch of beach (albeit a tiny and rocky one), open views of the water to the front, and a pretty green park to the back, it’s easy to forget that just over the horizon lays the New York City skyline. Instead, I feel like I’m transported miles away, to one of my favorite little coastal towns, enjoying a quiet moment soaking in the scent of a fresh spring breeze. Whether I am at home in Red Hook or a few hours away in Rhode Island, my “spring adventuring” look is pretty much the same. 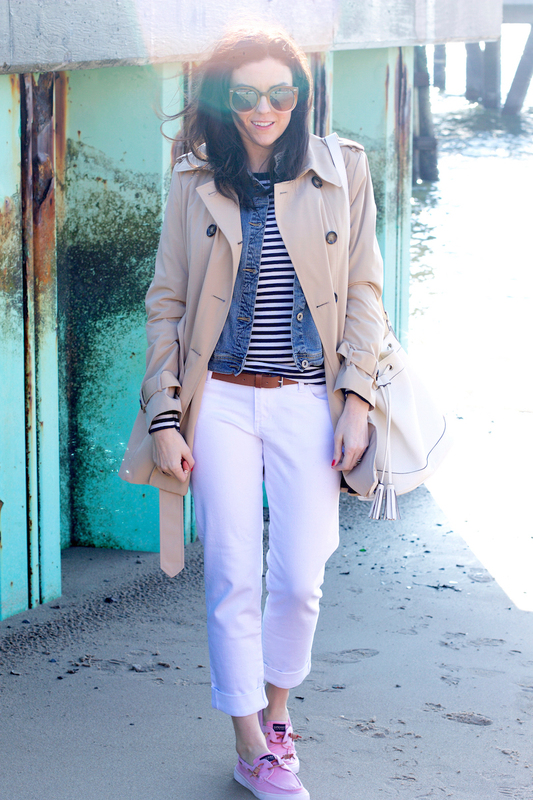 Comfy, casual yet put together, stripes, brights, light layers. Recently I added a new character to this style story, a pair of shoes so perfect it was as if they had been a part of my adventuring gear all along. These Sperry shoes are beyond comfortable, casual but still very put together, light as a cloud on my feet, and, of course, I love the bright pink color (I mean, pink for spring…you can’t go wrong). For a brand that invented the boat shoe all the way back in 1935, it only made sense that my new shoes were rockin’ the boat, er, I mean my closet. At the first signs of spring a couple weeks ago, I immediately threw them on with white boyfriend jeans, my staple striped tee, and, since it was still chilly, a layered classic trench and stand-by jean jacket, and then I took my new shoes out on their maiden voyage. It was too cold to stay outside for long, but with the official start of spring, I know that many odysseys await my new shoes and me.